IT'S not often we write a story about a winner at Mount Gambier, but when a mare has two foals and comes back to win a race we'd like to know a bit more. Six year-old Dubai Destination (USA) (pictured) mare Lost in Dubai broke her maiden at Mount Gambier last Sunday for the Wayne Walters stable, leading throughout to win the 1200 metre maiden by more than two lengths at her second run back from a lengthy spell. A spell so lengthy, it spanned 205 weeks! Her only previous run before her current preparation was on June 3, 2009, when she finished fifth in a juvenile event at Canterbury for Jason Coyle when carrying the colours of Patinack Farm, who had purchased her from the 2008 NZB Premier Yearling Sale for $260,000 from the draft of Monovale Stud. Lost in Dubai was hustled off to stud only a couple of months after that first run and produced her first foal for Patinack Farm, a colt by Casino Prince, in October, 2010. Named Kiss Me, he has since been exported to Singapore and is yet to race. 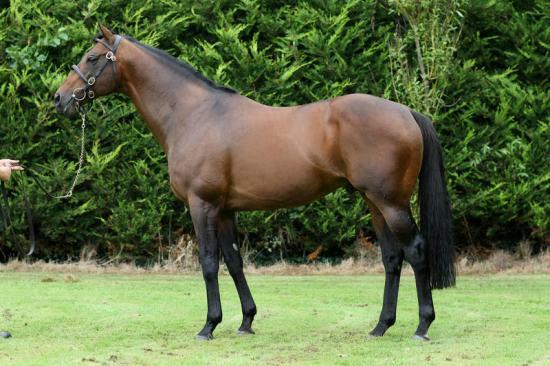 Lost in Dubai then produced a colt by Husson (Arg) before missing the next two seasons to Murtajill and Monaco Consul. At some point after that she was cut from the Patinack Farm broodmare band and sold privately, her new owner electing to return her to the track with pleasing results. Ironically, Clare Park Thoroughbreds will offer a Husson x Lost In Dubai colt in it's Ready To Run draft. It is not uncommon in the equestrian world for mares to take a season or two off to have a foal and then return to their previous careers, but in racing it's a rare occurrence, so the progress of Lost in Dubai will be something we will be following!